PolyAn Plex bead kits provide a platform for the design of multiplexed suspension arrays that can be run on standard flow cytometers. PolyAn offers a 25-plex (peaks) set of beads that can be distinguished by both different fluorescence intensities of our PolyAn Red4 dye (Excitation: 590–680 nm/Emission: 660–780 nm) as well as three different sizes (3.5 μm, 5 μm and 9 μm). The standard packaging volume is 1.5 mL/population with a solids content of 0.5%. Our PolyAn Plex beads are also available with Protein A/G and 3D-Azide surfaces. A custom modification with antibodies, peptides or oligonucleotides is available upon request. 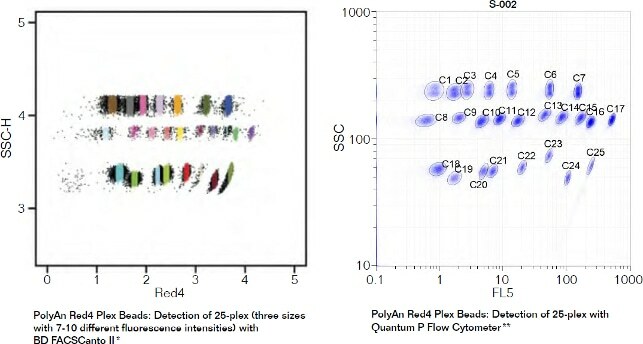 The image below illustrates the read-out of all 25 populations of the PolyAn Plex Red4 beads at one setting using different flow cytometers. Images courtesy of *Systems Immunology Lab (Humboldt Universität Berlin) and **Quantum Analysis GmbH, respectively.